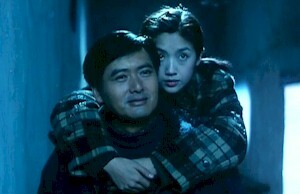 The Skinny: A typical Hong Kong mishmash of multiple genres, except this one is buoyed by the lovely chemistry between Chow Yun-Fat and Wu Chien-Lien. by Kozo: Chow Yun Fat’s triumphant return to HK film after a two year lay-off finds him in a true Hong Kong film. Jeff Lau directs this multi-genre piece that combines action, comedy, romance, and other assorted genres into one big package. The result is uneven, littered with too much in too many directions. The supposed plot is thin as paper and the drama isn’t really all that dramatic. Yet, hidden in there are some truly fun, sweet moments. Plot: Chow Yun-Fat is Chang Ching, a CIA operative sent to China to find a mysterious “treasure.” For some reason he shacks up at a local Shaolin temple where the gags pile on, especially in the form of an overweight Shaolin kid who either charms or annoys depending on your taste. Then Wu Chien-Lien shows up as Siu Ching, a girlish ESP misfit who’s imprisoned at the temple for reasons that would only give away the plot.